Alright my Trekkies, it’s time to rejoice. Star Trek: The Next Generation is confirmed for Blu-ray and will be released next year in January. The first set will include select samples of popular episodes. The Season 1 set will be released later in 2012. They’re really taking special care on this release, as they will be using the original negatives, that’s like 25,000-plus reels of footage, and will be editing each episode as they were intended to be. Let’s hope they don’t pull a Lucas. The special effects will be recomposited. The sound will include 7.1 DTS Master Audio. 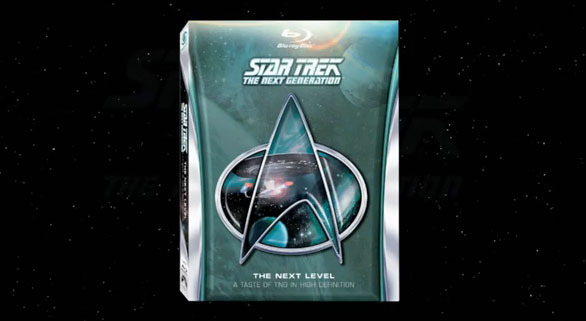 The first Star Trek: TNG Blu-ray, which is called Star Trek: The Next Generation – The Next Level, will be released on January 31, 2012. The episodes will include the feature-length version of the series pilot, “Encounter at Farpoint,” “Sins of the Father” and “The Inner Light.”. The pricing will be $21.99.